I’m not a very good repeat eater. I get tired of meals pretty quickly. I like to eat a meal and move on to something different next time. That’s one reason I enjoy my freezer so much because I can freeze the leftovers of a big batch and not have to plow through the whole amount in a few days. My dad told me that when he was growing up my grandma used to make a large pot of a recipe, usually cabbage rolls, and she would keep them in a warming oven on the counter and they would eat them all week. ALL WEEK. Come Sunday she would start again with a new batch. My dad wasn’t a very picky eater probably because he was just thrilled to have something other than a cabbage roll when he got it. Now, don’t get me wrong, her cabbage rolls were delicious, but I can’t imagine eating the same thing day in and day out for years. So where am I going with my repeat eater story? My point is, and I do have one, that I like recipes that are easily multiplied or divided depending upon how many people you are serving. That way I can make the appropriate amount and then move on to something new. Today’s recipe is a good one for that. 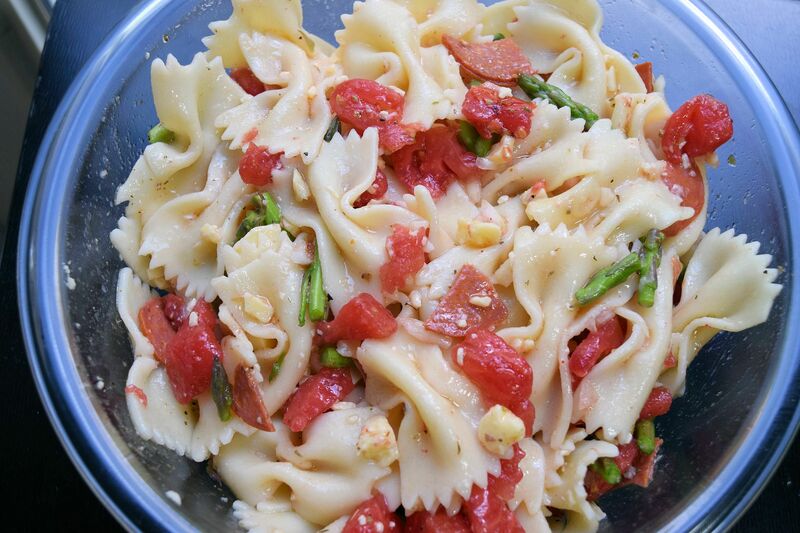 It is also a good recipe for summer because it is a cold pasta salad. 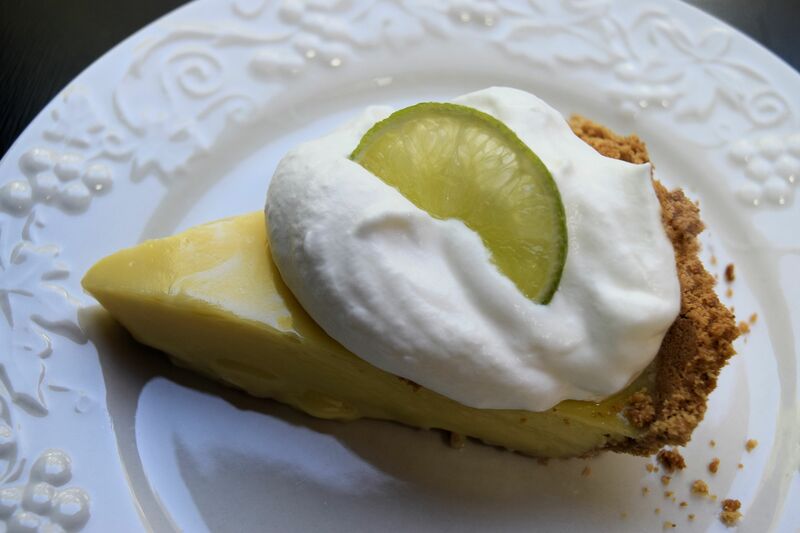 For dessert, I made a Key Lime Pie. Both recipes are best made ahead and then when you are ready to eat, pull them out and enjoy! Cook macaroni according to package directions; cool, drain. 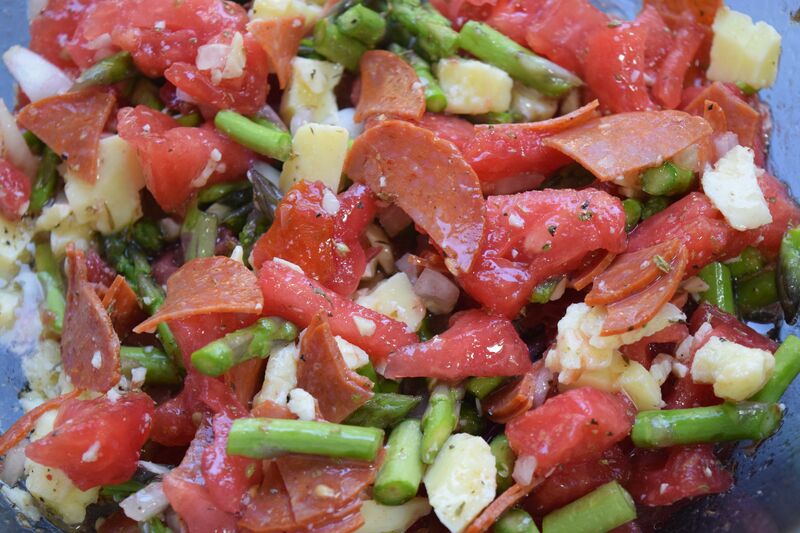 Combine macaroni, cheese, tomatoes, onion, green pepper or asparagus, and pepperoni. Mix oil, Parmesan cheese, oregano, garlic powder, salt, and pepper. Stir into macaroni mixture. Chill for several hours before serving. Serves 8. Here it is before I added the pasta. You could eat it like that, too.